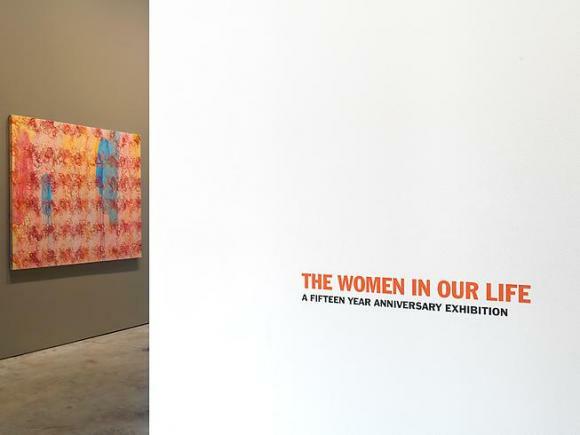 ﻿In celebration of our fifteenth anniversary, Cheim & Read is pleased to announce a group exhibition of the women artists with whom they work: Ghada Amer, Diane Arbus, Lynda Benglis, Louise Bourgeois, Louise Fishman, Jenny Holzer, Chantal Joffe, Joan Mitchell, Alice Neel and Pat Steir. John Cheim and Howard Read have worked with several of them – Arbus, Bourgeois, Neel and Steir - since the early 1980s. In 1996, the two opened their gallery with an exhibition by Bourgeois and Holzer. Since its founding, Cheim & Read has brought several women artists to the gallery’s roster – their selection, impressive in its scope, evolved in response to the artists’ individual work. Many of the works in this exhibition will be shown for the first time. The ten artists represented engage a variety of artistic processes and thematic concerns; their diversity provides substantial evidence for the major movements of post-war American art, from the Abstract Expressionist brushwork of Joan Mitchell to the conceptual, word-driven installations of Jenny Holzer, to the subversive embroideries of Ghada Amer. But though each artist’s obvious uniqueness is celebrated, the generational span among them also reveals interesting parallels and influence: Mitchell’s abstractions lead to Lynda Benglis’s gestural floor pourings, to Louise Fishman’s densely-worked canvases and to Pat Steir’s chance-driven exploration of painting (all three artists were born around 1940). Alice Neel’s intense, sensitively detailed portraiture is echoed in Chantal Joffe’s forward-gazing figures and Diane Arbus’s sometimes shockingly intimate documentary photographs. Louise Bourgeois, who died last year at the age of 98, spanned them all, anticipating artistic tendencies and rebelling against easy categorization. Ultimately, the ten are united by the conceptual construction of their imagery and the physical process entailed in its making, their artistic practice met with determination and profound self-awareness. In advertising for the show, and as a memorial to Elizabeth Taylor, Cheim & Read selected an iconic image from the 1960 film BUtterfield 8, in which Taylor scrawls “No Sale” in pink lipstick across the bedroom mirror of a recent lover. She was responding to what later is revealed to be a misunderstanding over “payment”; thinking that the money implied reimbursement for sexual services, Taylor’s character emphatically shows that she cannot be bought. From a feminist viewpoint, Taylor embodies a sexual persona rivaling and subverting the power of the male gaze – as Camille Paglia noted in a 1992 Penthouse article: “Elizabeth Taylor is pre-feminist woman…Through [her], we sense the world-disordering impact of legendary women like Delilah, Salome, and Helen of Troy.” Taylor’s messaging on the mirror is an apt metaphor for the strength, tenacity and originality of the artists brought together for this exhibition, consistently forging their own paths against the strong current of a male-dominated art world. Though not all represented here embraced feminism in the political arena (Mitchell and Bourgeois were notably ambivalent about the movement), they all refused to answer to anyone but themselves, effectively writing “No Sale” on their artistic identities. Overlooked at first, some artists, like Alice Neel and Louise Bourgeois, are now icons. Their work, once relegated to the outskirts of artistic popularity, is celebrated and incalculably influential. Cheim & Read had not intentionally set out to promote women artists, focusing instead on an organic, un-premeditated cultivation of individual and critical artistic voices. However, the artists assembled in this exhibition have proved to be some of the most important voices of the last few decades. For more information please contact the gallery at 212-242-7727 or gallery@cheimread.com.